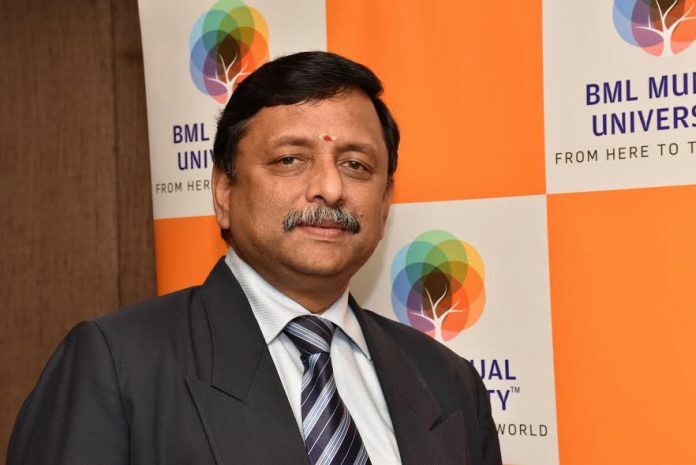 New Delhi: BML Munjal University (BMU), founded by The Hero Group, and located in Gurugram (National Capital Region of Delhi) has emerged as the new hub for aspiring engineers from the South. Prof. B S Satyanarayana, Vice Chancellor, BMU and senior staff members of the University were in Hyderabad on 7th April 2017 to strengthen this growing relationship by interacting with media persons and parents of students who hail from the city. BMU is distinct in its unique curriculum and pedagogy, which is exemplified by 45% practical hands-on learning component in its engineering programs. This approach to learning and doing has organically drawn students who are driven by an intrinsic passion for the sciences, engineering and technology, as tends to be the case among most engineering aspirants from Andhra Pradesh and Telangana. Not surprisingly, from the very first year of operations, the University campus in Gurugram has attracted a high number of very talented students form these states. At present, students from Andhra Pradesh and Telangana constitute almost 45% of the student body. They seem to have found a second home more than 1500 kilometres away, adapting comfortably and sharing about their culture and academic experiences with the rest of the student body. The University believes the providing a supportive and nurturing environment will enable students to make the most of the opportunities it offers. An active campus life, multi-cuisine dining facilities with special provisions to cater to the South Indian palate, supportive faculty members and staff on campus and a vibrant and diverse peer group ensure everyone has the opportunity to grow as well as contribute to the University space. The University is also sensitive to the pressures and emotional/mental challenges faced by students today. The competitive nature of the engineering entrance exams which has achieved disturbing proportions, particularly in certain regions, is beginning to affect young college bound students. The peer pressure only increases once they reach the best colleges in the country. BMU has taken cognizance of this increasing stress among students and launched a dedicated Counselling Centre with the support of leading experts in the country. The Centre is the most recent initiative undertaken by the university to fulfil its commitment to its students’ overall wellbeing in addition to academic excellence. The Centre will be fully functional from May and will work closely with the students; guiding them through any stress or anxiety related to academics, peer interactions, confidence and help them cope with living away from home, often for the very first time. Commenting on the initiative, Ms Rupa Murghai, BMU counsellor with experience of more than two decades in this space said, “Teachers and parents all have the same goal – giving their children only the best. Encouraging parental involvement is all about playing on a sense of community – a community with a shared goal – so everyone gets to add their piece to the complex education puzzle. Students come from different part of the country to study at the campus and parents back home are worried on the well-being of their kids. We encourage parents to play an active role along with the university to solve student’s issues/ problems”. With strong academic and industry collaborations is focused on hands-on and inter-disciplinary learning, BMU is one of the few universities to offer specialized programmes in keeping with current industry requirements. The University has reiterated its focus on cross – disciplinary learning, R&D, and innovation, along with specialised courses in Engineering, Data Analytics & Forensic Accounting. BML Munjal University has consistently focussed on student-learning experience. Collaborations with renowned universities such as Imperial College London (which is BMU’s academic mentor), Singapore Management University, Robert H. Smith School of Business, University of Maryland (USA), and corporates such as Axis Bank, Intel, IBM, KPMG, Siemens and Shell have allowed students to get a perspective on global trends in education and the contemporary professional world. All BMU MBA students can have the opportunity to study the Global Leadership Module at Imperial College Business School in London or at Singapore Management University – a two week, immersive module that allows students to gain new perspectives on global business practices, challenges, and cultures.